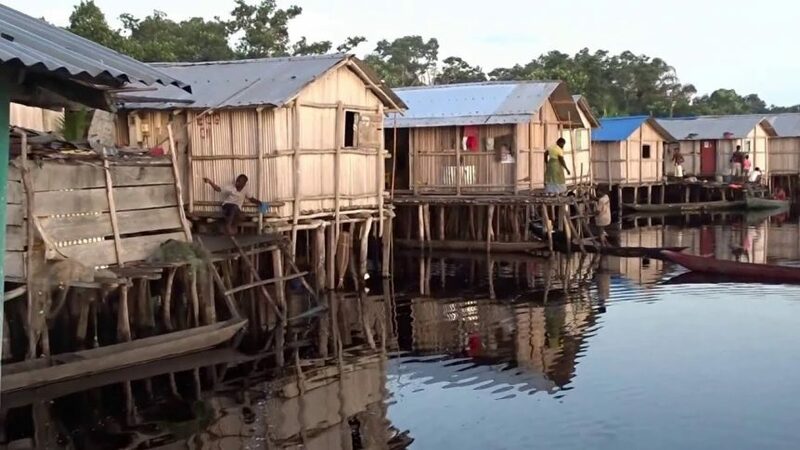 Nzulezu stilt village in the Western Region | Your Beach House in Ghana • Right at the ocean! Nzulezu in the Western Region of Ghana, is a unique water village. This wonderful village is built wholly on stilts on an open lake fed by seven rivers. The name of the community is an Nzema phrase meaning “built on water”. Nzulezu gives you the opportunity to watch lovely birds as the Egret, the Grey Heron, the White Heron and various species of Kingfishers. As you visit Nzulezu take your time to go through Nzemaland to see the Birth place of the first president of Ghana, Dr Kwame Nkrumah. (Nkroful), as well as Fort Apollonia in Beyin, Fort St Anthony at Axim, the Egyambra crocodile sanctuary, the Ankobra River Estaury and beach. You may furthermore be fortunate to witness the colorful Kundum festival celebrated by the Nzemas and Ahantas of the Western Region. Spend the night in homes of the people to learn more from their culture. Or enjoy your night stay in one of the Guesthouses, which will give you a night to remember. Nzulezu is 90km west of Takoradi and 5km north of Beyin.